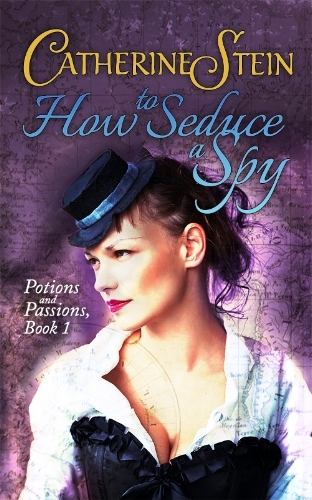 Step into the world of Victorian potions and meet the sassy heroines and sarcastic heroes who live and love there. With time of the essence, Elle and Henry must rely on one another to avert disaster. As enemies close in, they find the greatest danger of all may not be to their lives, but to their hearts. Rachael Fasching doesn’t shy away from scandal. But living her whole life with the name of her murderous late husband? Intolerable. Her solution: find the most passionate, romantic man in all of England and marry him. When she discovers that “dull and disagreeable” historian Avery Cantrell is the secret author of warrior love poems, she takes the risk and sets out to woo him. Avery has spent his entire life researching, in the hopes of finding a cure to the ancient affliction that has made potions deadly to every male of the Cantrell family line. He needs to marry, but he wants the matter addressed efficiently: no fuss, no delays, no timid virgins. Beautiful, enigmatic Rachael seems the perfect candidate. When news of a murder interrupts their wedding plans, Rachael and Avery stumble upon a mystery of long-forgotten magic and deadly secrets. Plots and poisons threaten their marriage-of-convenience, but as they delve into the intrigue together these unlikely heroes might discover they have what it takes to hunt down a killer—and to find true love along the way. Trilobite expert Lady Astrid Wembley wants nothing more than to earn herself a place in a scientific society. When she is threatened with incarceration in an asylum for her "unladylike" behavior, she enlists the aid of a noted physician. The only trouble: his medical theories are absurd and he's far too attractive for his own good - or hers.